Good Luck Girl! began its runtime during mid-2012. The plot centres on Ichiko Sakura, a young high school girl, who for her entire life, has had overwhelming luck due to the fact that she has an incredibly high about of Fortune energy. She is wealthy, beautiful, athletic, smart and everyone adores her. As it turns out, she has been absorbing all the Fortune energy from everyone around her, in turn ruining their lives and upsetting the balance. 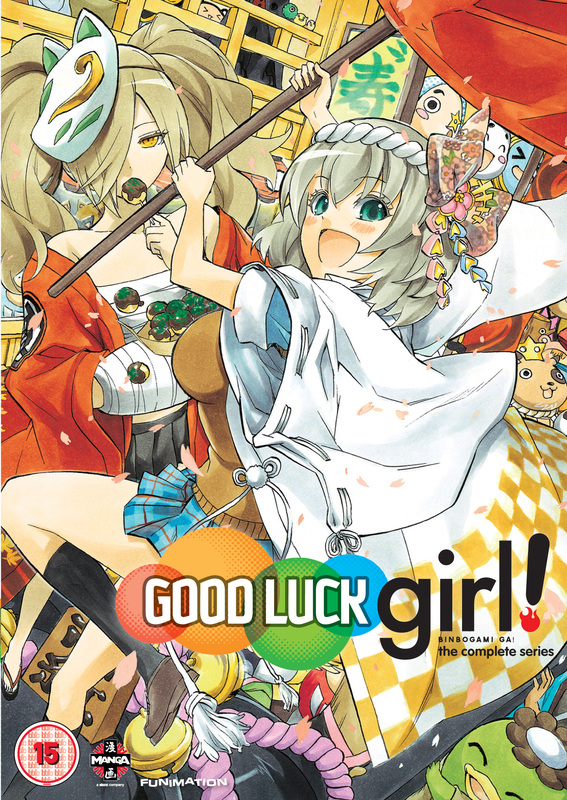 Then, one day the God of Poverty, Momiji, an unkempt, depressed mess, is sent to the human world with the goal of stealing Ichiko’s excessive fortune energy and restoring balance to the world. The two girls will battle it out, one attempting to help the population, the other trying to retain her selfish good fortune. Their battle will affect everyone around them in good ways and bad ways. My Review: I had so much fun watching Good Luck Girl! The whole show is full of hilarious homages, references and parodies of other animes and depending on what ones you can recognise, it really makes the show special. The show is brilliantly self-aware, it takes great pride in making fun of many typical anime tropes. For example, the show has a “bath house episode” which it opens with a musical entitled “Ode to the Fanservice episode”, I’m sure you can figure about what it’s about. I just loved the nonsensical randomness, it’s not random for the sake of random, there is a lot more though involved. The characters are all centred on one major characteristic and aren’t that detailed but I didn’t think that it was really a problem, considering the nature of the show. I enjoyed the first episode of this but I found the comedy wore thin after a bit. Though that’s probably more to do with my low tolerance of comedy than the anime. Thanks for sharing your thoughts on it.